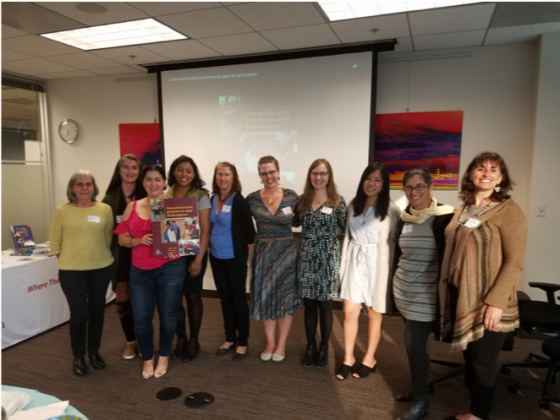 On August 23rd, 2018, GOJoven International partnered with Hesperian Health Guides to co-host the Bay Area launch of the Spanish edition of “Health Actions for Women” (Guia Practica para promover la salud de las mujeres) at the PHI headquarters in Oakland, California. Developed and field-tested with dozens of organizations across Latin America, this resource is critically important in the movement for women’s health: teaching women and men to counteract harmful gender roles, promote safe motherhood, improve access to family planning, end gender-based violence, and so much more. 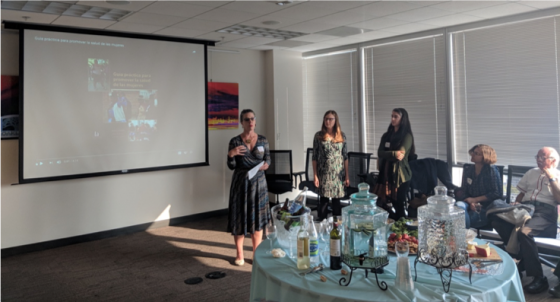 GOJoven International’s Senior Program Director Esther Tahrir and Susanna Moore, Project Manager, provided the introduction and background to the long collaborative relationship between Hesperian and GOJoven International, encompassing the production of this important new resource. Claudia Romeu of PHI’s Rise Up program also spoke alongside Sarah Shannon, Executive Director of Hesperian Health Guides, and Miriam Lara Mejia, Bilingual Programs Coordinator for Hesperian. GOJoven was one of 40 community-based organizations in 23 countries to contribute to the development of this new health education resource. In 2011, Hesperian approached GOJoven Director Esther Tahrir to discuss field testing two draft chapters of the Spanish edition of Health Actions for Women: “Family Planning” and “Sexuality and Sexual Health.” GOJoven was supportive of this project and promoted the field testing opportunity among GOJoven graduates and staff in Central America, who themselves are topical experts and trainers. GOJoven members Esther Barajas, Rudy Felipe, and Ana Lourdes Tojin, among others, agreed to review and/or field test selected activities of specific chapters. The Spanish launch event hosted at PHI headquarters highlighted this partnership and the value of the GOJoven leaders’ feedback to Hesperian in improving the training guide activities, as well as in gathering new ideas for illustration and word choice in the manuscript. Additionally, Marin Vasquez, a Guatemalan youth leader from PHI’s Rise Up program Let Girls Lead, contributed in the field testing of this guide. Just a few weeks before this launch event, Hesperian Health Guides held its local launch of this resource in Guatemala City, on August 2, 2018. GOJoven Guatemala staff members Marta Honoria Castillo, Erasmo Leon, and Cristian Morán were among over 100 attendees at the event. Speakers included Lucrecia Hernández Mack, a visionary who made valiant attempts to reform Guatemala’s troubled public health sector during her recent though short-lived tenure as Minister of Health, and Elsa Rabanales, a dynamic young organizer with the rural indigenous women’s network Actoras de Cambio, based in Guatemala’s highlands. In an effort to improve access to and provide immediate availability of the book to regional partners, Hesperian piloted a local print run of 200 copies of the guide at a Guatemalan print house. Moving forward, Hesperian hopes to distribute its materials more widely, particularly in the Central American region. 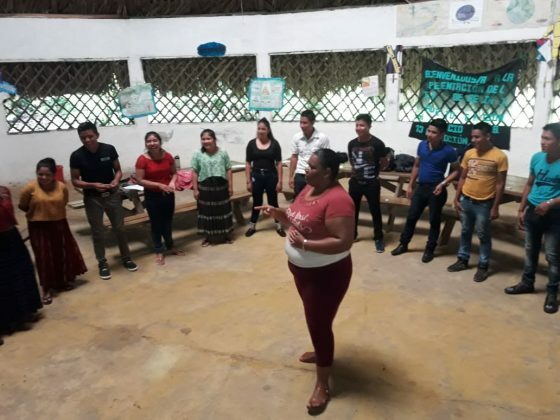 At GOJoven, we deeply admire and support Hesperian’s work to provide health education and help individuals take greater control over their health. Because we share a common mission of improving the health, SRHR, and development of communities at the local level, we are proud to partner with organizations like Hesperian to further advance these goals in the communities we serve. As such, we have disseminated this new resource across the GOJoven Alumni network of over 400 young leaders in Mexico and Central America and the 4 GOJoven Alumni Associations that are deeply embedded in the sexual and reproductive rights and women’s and girls’ rights networks in their countries. The GOJoven Associations are excited to use this practical, user-friendly Guide in their own field-based training activities with women, girls and other community leaders, and we envision that this resource will be a powerful tool as they continue empowering other young women and men to become advocates and leaders in family planning and reproductive health. For more information about Hesperian books and resources, see www.hesperian.org.